Regardless of where you are in the world, someone wants to know, “Are there vegetarian options available?.” When I first think about Portuguese cuisine, vegetarian or vegetables are definitely not what come to mind, while fish, meat and rice are more common. But as a foreigner, I am no expert. So I decided to take a poll of every Portuguese mama and grandmama I could get my hands on, as well as their twenty to thirty-something year old sons still living at home and enjoying their cooking. To no surprise, much of the answers were the same, “Cozinha vegetariana? Uhhh…… I don’t think we have that”, with a peculiar expression that inferred, “why would anyone want to just eat vegetables? 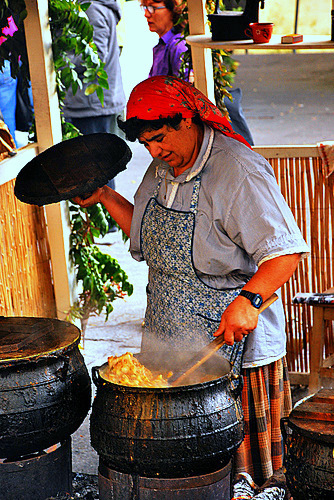 ?” And true to point, most of Portugal’s famous dishes contain some form of protein and starch, and although vegetables are included, they are almost never the main feature of any dish. Now, while my poll didn’t immediately turn up any traditional vegetarian dishes, when pushed, there was a consensus that, “Well, we have good soups”. It may not be a classic entrée, but soup is one of the main choices for a “quick lunch” during the business week. Most Portuguese soups are vegetarian, all traditionally prepared in a style which I have come to believe is the quickest and easiest way to make a guaranteed delicious soup every time! The Portuguese soup is thick with a vibrant orange color, derived from pureed carrot, pumpkin, potato and onion, give or take one depending on the soup. Pumpkin may seems like an abnormal seasonal vegetable but you can buy chunks of pumpkin or orange squash in open markets and supermarkets throughout the year, adding a delightful “sweet” richness. Cooks will add vegetables and garlic into a pressure cooker for about 20-30 minutes then pass them through a food mill and voila, a touch of salt and your basic soup is ready to eat! Many build upon this base by adding cooked green vegetables such as nabiças (kale), espinafres (spinach), feijão verde (long green string beans of the fava variety) and couve (cabbage), which is usually paired with red kidney beans (feijão). So for all of you vegetarians and veggie lovers, don’t cross Portugal off your list of places to live or travel because of lack of food options! A big bowl of any of these hearty Portuguese vegetable soups makes for a delicious lunch or meal anytime! And if you’re not a big fan of soup, you need not worry in finding an abundance of ingredients for creating your own vegetarian versions of traditional favorites here. Or, if you’re not much of a cook, and prefer to eat out, there are loads of great Portuguese vegetarian restaurants that have opened in Lisbon with positive reviews. Thanks to a country full of the “fruits of their labor”, or shall we say veggies, Portugal offers a memorable food experience for every preference!